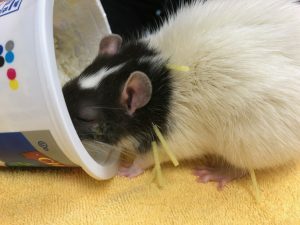 Incisor malocclusion, as well as vestibular like signs including head tilt, secondary to otitis interna or media are commonly reported conditions in the domesticated rat. These conditions can be associated with systemic illness, trauma, and malnutrition. 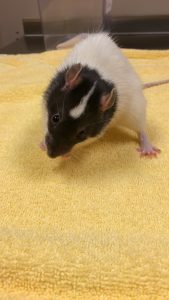 As demonstrated with this patient, ‘Felix’, chronic head tilt due to vestibular dysfunction can often affect quality of life. 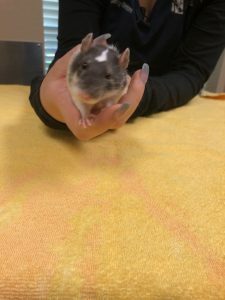 In conjunction with standard medications such as antibiotics and dental procedures to manage malocclusion, acupuncture has been demonstrated in this patient to improve quality of life at home based on the owners observations and myofascial exam. Based on exam findings dry needle techniques were performed focusing on areas of restriction, discomfort, autonomic and immune modulatory points. After two acupuncture sessions, the owner of this patient felt an improvement in both energy and appetite at home. 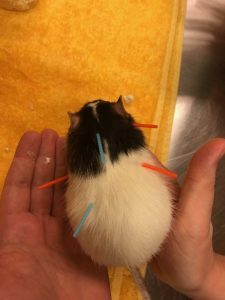 Unfortunately, shortly after the fourth acupuncture session, ‘Felix’ passed away due to unknown cause. 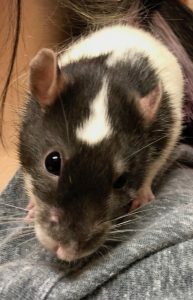 ‘Felix’ is a two-year-old male neutered domestic (pet) fancy rat. He was adopted six months ago from a local rescue. At time of adoption it was known and documented a history of chronic vestibular disease with head tilt to the left in addition to a severe malocclusion causing his upper incisors to require monthly trimming. ‘Felix’ currently undergoes monthly dental procedures to trim back his upper incisors through his primary veterinarian. Additional to his malocclusion, he also suffers from chronic otitis most primarily on the left side. Little is known regarding ‘Felix’s’ history prior to being adopted. ‘Felix’ presented due to decreased activity, and owners wish to provide an alternative therapy to improve his quality of life. On initial physical exam, ‘Felix’ was found to have very tight left cervical muscles including the clavotrapezius muscle, acromiotrapezus muscle, spinodeltoideus muscle and spinotrapezius muscle. Thread like palpable bands were palpated along right lateral cervical region including the trapezius muscle group. Left biceps brachii palpated larger and more firm than the right side. ‘Felix’ showed mild to moderate agitation when palpated along the lumbar spine and would not allow for pelvic-limb palpation on initial exam. ‘Felix’ had prominent left sided head tilt with majority of his body weight placed into left pelvic and thoracic limbs. When at stand still ‘Felix’ would place his left thoracic limb more midline (adducted). He would readily climb and explore his environment. Body condition score was estimated to be around 3.5 out of 9. ‘Felix’ tends to walk with his tail extended out straight with midline placement and low to the ground. A small 2mm patch of alopecia appreciated just ventral to left eye where a reported previous tooth root abscess had ruptured. Upper incisors were overgrown with severe overgrowth of left upper incisor. Other than left sided head tilt, no obvious neurological deficits appreciated. Patient did not allow for full assessment of conscious proprioception. Adequate voluntary motor appreciated in all four limbs with no evidence of dragging or knuckling. Vision appears to be appropriate and good prehensile use of hands. After second and third acupuncture sessions, myofascial exam did seem to improve. Muscle tension and myofascial restriction of the left cervical region (primarily trapezus muscles) appeared improved. Reactivity along the spine also seemed to be decreased and patient allowed for pelvic limbs to be palpated. Left quadriceps muscles palpated thickened and tighter than the right with increased bulk in left gastrocnemius muscle. At the second visit, patient had recently undergone a general anesthesia dental procedure two days prior. No change to head tilt and minimal to no change in limb placement during ambulation was appreciated. At fourth visit, stance appeared to be slightly improved with a more wide based stance. Head tilt still unchanged at each visit. Less left sided cervical muscle tension appreciated. Left forelimb still palpated thicker than right but patient overall has slightly improved body condition score, now estimated to be approximately 4.5 out of 9. Owner reports a much-improved quality of life at home. Patient is now using his running wheel on a regular basis which he had previously stopped using, and is also eating a wider variety of food. o Suspect compensatory to head tilt and vestibular like signs. Chronic vestibular disease secondary to severe malocclusion, chronic reoccurring tooth-root abscess and otitis interna/media leading to progressive ongoing muscle tension/changes and myofascial restrictions. 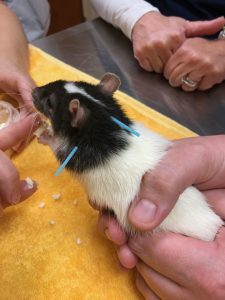 Given the behavior and size of the patient in addition to areas of tension, bands, or reactivity a minimal approach was taken during the first acupuncture session with primary focus to areas of tension or restriction around the neck and forelimbs. Sub-sequential sessions, more focus was provided to left ear and facial points in addition to cervical muscle groups and limb points including known autonomic. Given chronic infections, immune modulatory points were also used. At the first visit patient was distracted with baby food and cream cheese. Due to a limited supply of needles at this visit, Seirin15mm x 0.2mm needles were used for all of the points. Both tube insertion, as well as, hand insertion technique was used. Minimal points were used since this was the patients’ first acupuncture session. Points used: GV 20 as a grounding point, local neck tension, and to gauge the patients’ acceptance of acupuncture. BL 10 and BL 13 (right and left) used and placement elected based on areas of restriction, tension, and bands found on palpation. LI 11 used as both an immune modulatory (and anti-inflammatory) point, as well as, tension of brachial muscles specifically triceps brachii and biceps brachii. Bai Hui used for pelvic limb support and additional autonomic point. GB 21 used for regional muscle tension and thoracic limb dysfunction. Patient tolerated needle placement for less than three minutes. Second visit: Seirin 18mm x 0.15mm used as well as Korean hand needles (18mm x 0.18mm). Patient tolerated Seirin much better than Korean hand needles. GV 20 and Ying Tang used for ‘grounding’ and autonomic modulation, as well as, cranial cervical spinal innervation. GV 14 used for cervical tension in addition to parasympathetic stimulation. Patient did very well for this session and allowed for several points including BL 20 and BL 13 (bilaterally). BL 20 and 13 were decided due to palpable areas of restriction or tension and patient compliance. SI 11 (left side only) for myofascial restriction in this area as well as trigger point for triceps. Cervical nerve points (two on both the right and left side) chosen based on myofascial restriction. LI 11 (left side only) for immune modulatory stimulation, ST 36 (left side only) for autonomic modulation. (Patient only allowed for these points on the left side). Bai Hui used for pelvic limb support and additional autonomic point. TH 17 (left side only), SI 19 (left side only) attempted for trigeminal and facial nerve innervation to help with otitis and was tolerated for a short period of time. At the end of this visit, patient allowed for a gentle five-minute massage of neck and forelimbs. At his fourth visit, ‘Felix’ was less cooperative, and more engaged with his environment. I suspect this was due to Appointment was shortened due to the patients unwillingness to cooperate. Again, Seirins 0.18mm x 20mm were used with both hand placement, as well as, tube placement technique. Locations similar to previously stated included: GV 20, GV 14, BL 10 (bilateral), TH 17 (left), local bilateral cervical points, LI 11 (bilateral), and Bai Hui. 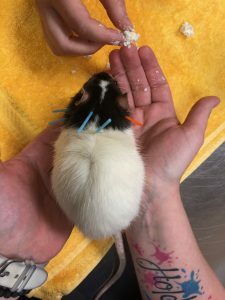 On palpation and physical exam, ‘Felix’s changes were slight and often difficult to appreciate due to the size of the patient and willingness to cooperate. Success of treatment was mostly guided by the owner’s report of behavior, appetite, and mood changes at home. Every other week appeared to be the most ideal time between acupuncture sessions before the owner would start noticing a decline in condition. 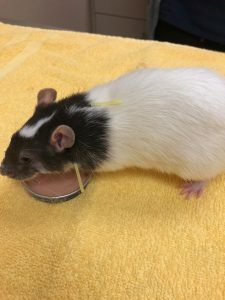 Owner felt that acupuncture mixed with his monthly medical dental procedures drastically improved ‘Felix’s’ overall quality of life. Although his head tilt did not resolve, his discomfort on palpation drastically improved. 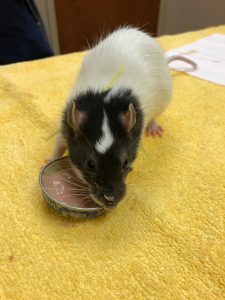 As demonstrated, by the fourth visit, Felix was much more active and less likely to sit still for his treatments. This is likely due to release of some of the areas of tension from his head tilt and posture compensation. 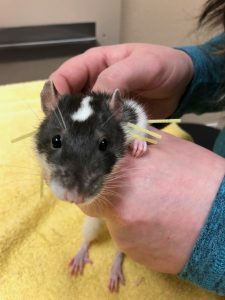 Sadly, ten days after ‘Felix’s fourth acupuncture session, he was found deceased in his cage of unknown cause. 2) Osofsky, Anna, and Frank J.M Verstrete. “Dentistry in Pet Rodents.” Compend Contin Educ Vet, vol. 28, no. 1, Jan. 2006, pp. 61–74. 3) Powers, Laurena V. “Vestibular Disease in Exotic Companion Mammals.” Pacific Veterinary Conference 2016.